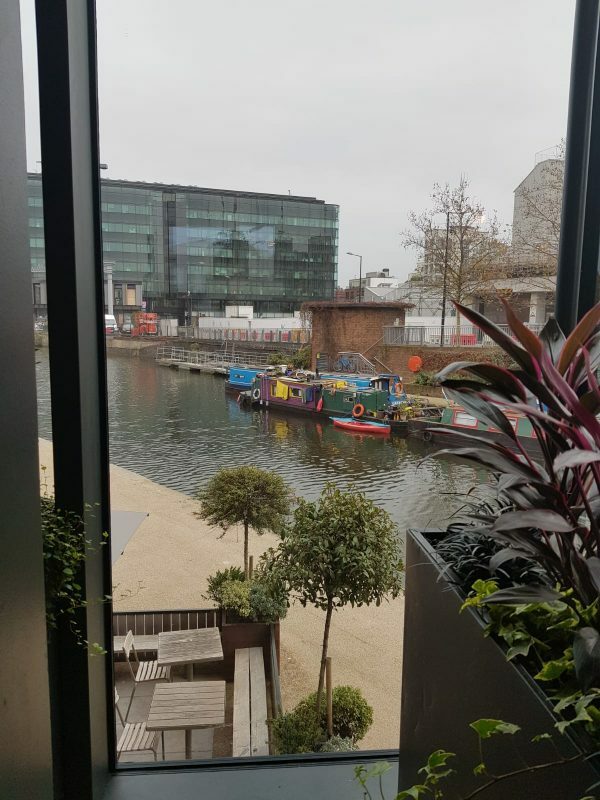 From the outside, The Lighterman restaurant in King’s Cross looks like a contemporary log cabin, right on the edge of the canal. It is a little haven on the edge of busy, bustling King’s Cross and Granary Square. Inside, it’s super cute and sophisticated, with a light and bright minimalist style and lots of green plants. It’s pretty spacious with 3 floors (a roof terrace and basement as well as the ground floor), and tables aren’t squished in which we love. The seats in the window are prime spot so you can get the fab view of the canal whilst tucking in. Service was really friendly and bubbly from the start, and attentive throughout to both us and the surrounding tables. 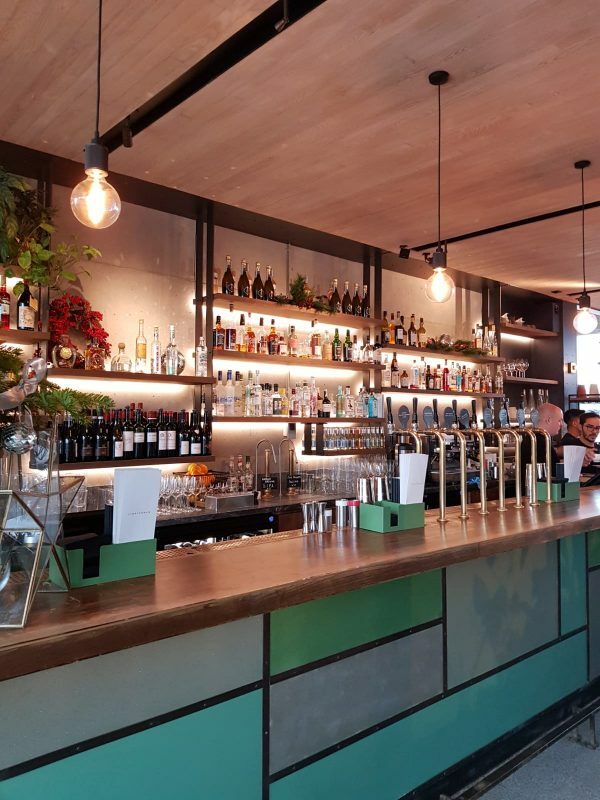 The Lighterman has all the usual hot drinks to accompany breakfast, as well as freshly squeezed juices and three of the most popular morning cocktails; a bloody Mary, peach Bellini and bucks fizz. The teas at The Lighterman are all Canton teas. The Breakfast Tea (£3) infused the hot water easily and well – no hot milky water flavours here. There’s plenty of it, roughly a cup and a half but they’re large cups, and it certainly satisfied that “good cuppa” craving. The freshly squeezed Apple, Pear and BlackBerry Juice (£4.50) was delicious. It wasn’t too sweet, and you could tell it was super fresh, as we kept stirring to combine the light froth with the juice underneath. The weekend breakfast menu is a tad more concise than the weekday one, so don’t be drawn in by some of the pictures on instagram. 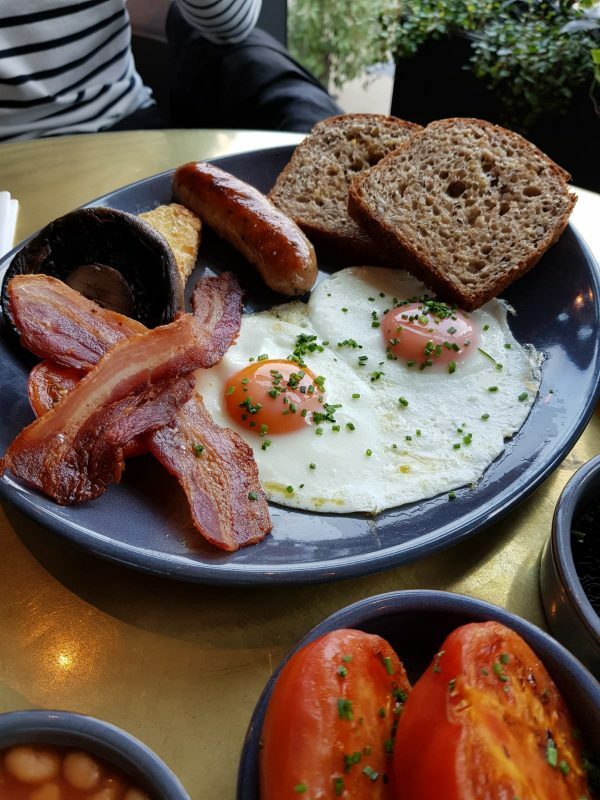 Whilst the baked eggs and pancakes do only make an appearance during the week, there is still plenty to choose from including fruits & grains, free range eggs and a full English. The Free range eggs (from St. Ewe in Cornwall), poached, on crushed avocado on toast with chilli and chives (£9.50) was seriously dreamy. The avocado was chunky, and plentiful. Deliciously fresh. The poached eggs were perfectly done, still oozy in the middle. We had feta on top too (£10.50), of which there was more than enough. The toast – well the bread was SO tasty. Altogether it was one of the best avocado on toast we’ve had. The Lighterman Full English Breakfast (£12.50) was fantastic too. Compiled of eggs (anyway you like), Cumberland sausage, streaky bacon, hash brown, field mushrooms, cherry tomatoes and baked beans it was one meaty dish. Requested sunny side up, the eggs were once again cooked beautifully. 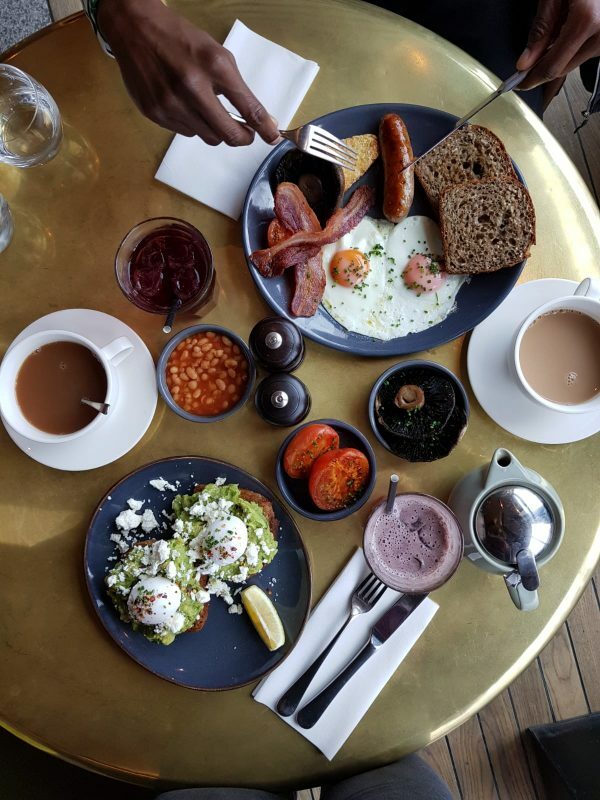 It even came with toast, made with the same bread as the avo on toast – one fab full english. 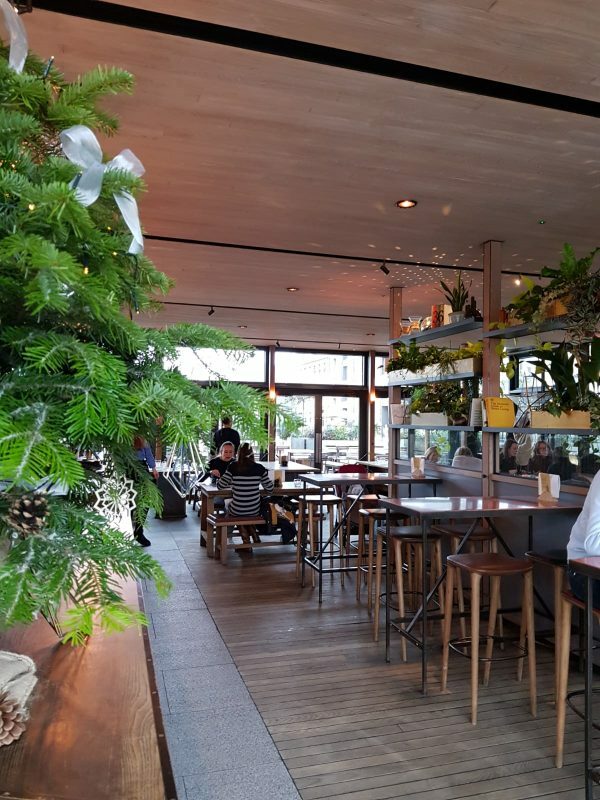 Well, our trip to The Lighterman restaurant in King’s Cross was one fab start to a Sunday. With great portions, the food was fresh and seriously tasty. With fantastic, friendly service…and breakfast with those views, we were big fans. We now just need to go in the week to try those baked eggs and pancakes!